Provides nutritional support to the bowel and liver. Offers a convenient, drinkable liquid formula for those who don't like to swallow pills. Liquid Cleanse provides a host of beneficial ingredients that help support healthy, natural bowel function. Aloe vera acts as an emollient and is soothing to the digestive tract and mucous membranes. Red raspberry and citrus extract lend their pleasant taste to the formula, and they provide important antioxidants. Senna helps to maintain soft stools and promotes bowel movements. Cassia cinnamon and fennel, aromatic herbs, are often used to support the action of cleansing herbs. Ginger and capsicum, two digestive aids, stimulate the flow of saliva, bile and gastric juices. Barberry, corn silk and dandelion may help remove toxins by supporting the function of the liver, gallbladder and kidneys. Aloe vera inner leaf juice concentrate, red raspberry fruit concentrate, senna leaves, raspberry natural flavor, cassia cinnamon bark, trace minerals, barberry root bark, xanthan gum, fennel seeds, stevia leaf extract, corn silk, ginger rhizome, dandelion root and capsicum fruit. 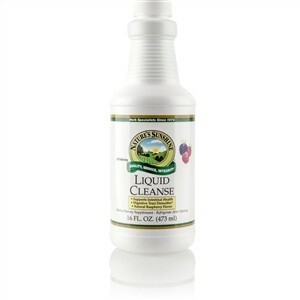 Take 1 ounce (30 ml) daily as part of your personal cleansing program. NOTE: Not intended for prolonged use. This product contains senna. See your health care provider prior to use if: pregnant or nursing, any medical condition exists or when taking any medication. Read and follow recommendation carefully. Do not use if diarrhea, loose stools or abdominal pain are present or develop. Not intended for prolonged use. Use of this product may worsen these conditions and be harmful to your health. Chronic diarrhea can result in serious illness.